I have often over looked Avery Brewery when I make my beer runs. Not that they have bad beer, they actually make really good ones. It’s just that they are always there, and I tend to look for new beers to my market. That all changed for me a few months ago when I found out that Avery would be pulling out of central Florida. I am not going to lie, I got scared. Avery was a brewery that I took for granted, and now they could leave my area at some point in the future. This realization inspired me to return Avery and their fine beers. To celebrate my return to Avery, I cracked open a bottle of Avery Maharaja, an American double IPA with 10.3% alcohol. 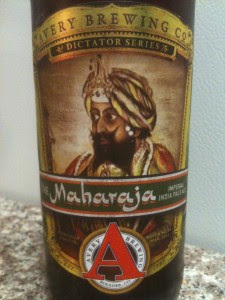 Maharaja is a seasonal brew from Avery in their dictator series. There was no date on the bottle and I served the beer in a snifter. and bready malts trying to balance out the aggressive hop flavor. The high alcohol appeared on the finish, leaving a slight warming on the palate. Maharaja is a near perfect DIPA and I enjoyed every sip of it. I fall victim to the same thing Charlie did- taking breweries for granted. It is hard to pick up beer from an old favorite, when you are always looking for something new. Maharaja is one of my favorite beers, and something when i see on tap, I always buy, but like Charlie, it has been a while since I have bought anything Avery in the store. The Maharaja is one of my favorite DIPAs ever. For 102 IBUs, it's not all that bitter or hoppy. It's quite balanced. Agreed though, I tend to overlook Avery too. Might have to focus on their Dictator series now. I'm always looking for something new too, but sometimes I check out the older stuff from great breweries like Avery. And I ALWAYS buy The Maharaja when a fresh batch comes out.